I mean, you gotta hand it to him. There are only a few men who could stand in front of the world’s press and say he is seriously considering the possibility of removing seating as an option from his airline, or charging people for going for a pee while on one of his flights. 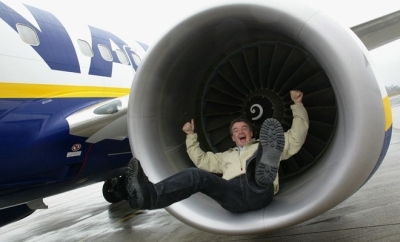 Meet Micheal O’Leary, CEO of Ryanair, and the king of low-cost airlines. The man is a rogue and not a particularly lovable one either, despite having an Irish accent, which generally gives people a bit of leeway. Ryanair is just one of the many low-cost airlines claiming to offer cheap travel. From Spirit to JetLite, you will find regional equivalents across the globe. And yes, at times, you can find some incredible deals. The truth (and the reason why O’Leary was worth nearly $5.5 million last time he checked his bank balance) is that there are plenty of hidden costs these companies manage to catch you with to make up the difference, as discussed recently by ABC News. If you don’t know how to play the game, you can end up forking over a small fortune for the privilege of playing fisticuffs for a window seat and listening to advertisements on repeat from a loudspeaker. But don’t let them disorientate you with their shouty websites and bright colors. Here are five tips on how make so-called low-cost airlines, work for you. While some, like BMI Baby, are pretty relaxed about printing boarding passes, and will do it for you for free and with a smile if you forget to bring it with you, others will expect you to pay an additional and exorbitant fee to do so. Ryanair charges 40 euros every pass they print for you. There is a name for this. Oh yeah: Daylight robbery. Do not make the mistake of thinking one piece of hand luggage means your hand luggage plus a hand bag. How strictly the rule of “one item of carry-on luggage” is adhered to can sometimes be less about the airline than the airport. Luton in the U.K. is particularly dogmatic about this, but if the people at the gate decide you have more than your fair share of baggage, you shall be forced to return directly to “go” and check-in those additional bits n’ bobs, costing you big dollar. And yes, it is ironic that those bits n’ bobs were disallowed due to “weight and space restrictions,” yet you can immediately buy 17 bottles of duty free vodka, and a family-sized Toblerone, and the flight attendant will even help you tuck it nicely away in the compartment where your bag would’ve gone. Check other, non-budget, airlines for deals. Standard airlines sometimes end up offering better deals, especially by the time you consider tax and the additional booking fees that don’t necessarily show up until you are about to book on a no-frills airlines. In fact, some charge you a penalty according to the type of credit card you use. There are two huge advantages to not checking any bags. The first is that with most of these airlines, you will not have to pay anything to travel with just your carry-on, while they will charge you to check a bag. Secondly, you can whiz straight from the plane to customs without waiting around for your stuff to come through. Yes, it’s all a bit family day out when you were seven, but bringing a sandwich and box of juice will save you the equivalent of a small car in what you would spend on a hot dog made out of horse parts when on board. Oh, and this one’s for free: don’t buy one of their lottery tickets. You think you will win. You will not win. So who is cashing out now Mr O’ Leary? Oh, um, yes, still you. You and your house of gold and massively successful business.